Cufflink size: 0.55 inches (14mm) 1 pair silver cufflinks， Material: copper，Easy To Match With Your Shirt;Made Of Healthy Brass,Add Thick Strengthening Clasps,Sturdy and Durable,Also Convenient to Wear,Long Time To Use. 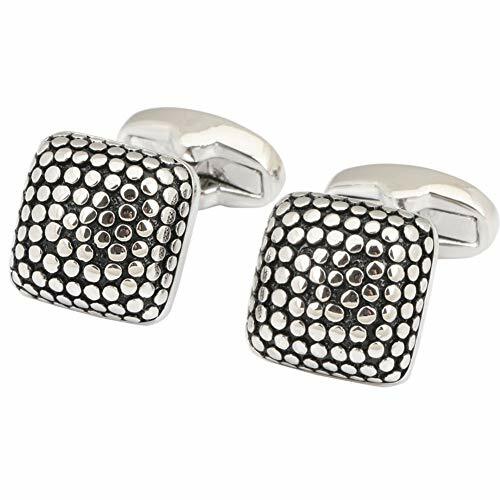 With a High Polished Smooth Surface, This Cufflinks is Perfect to Wear on Daily Basis or For Special Occasion. Light, Simple and Modern Design will Accentuate any Style Comes With A Beautiful Gift box, PERFECT GIFT - This Cufflinks gift for any Men's , Ideal to give on birthdays, Christmas, graduation or other occasion.Perfect Gift for Fathers Day, Anniversary, Valentine's Day, Birthday or Wedding for Groom and Best Man. silver cufflinks，Easy To Match With Your Shirt;Made Of Healthy Brass,Add Thick Strengthening Clasps,Sturdy and Durable,Also Convenient to Wear,Long Time To Use. PERFECT GIFT - This Cufflinks gift for any Men's , Ideal to give on birthdays, Christmas, graduation or other occasion.Perfect Gift for Fathers Day, Anniversary, Valentine's Day, Birthday or Wedding for Groom and Best Man. If you have any questions about this product by Dannyshi, contact us by completing and submitting the form below. If you are looking for a specif part number, please include it with your message.